For me conferences are always a good time, and I really like the energy and inspiration I draw from a conference. And WJax was no difference! Let’s dive right into of what I saw at WJax 2014. 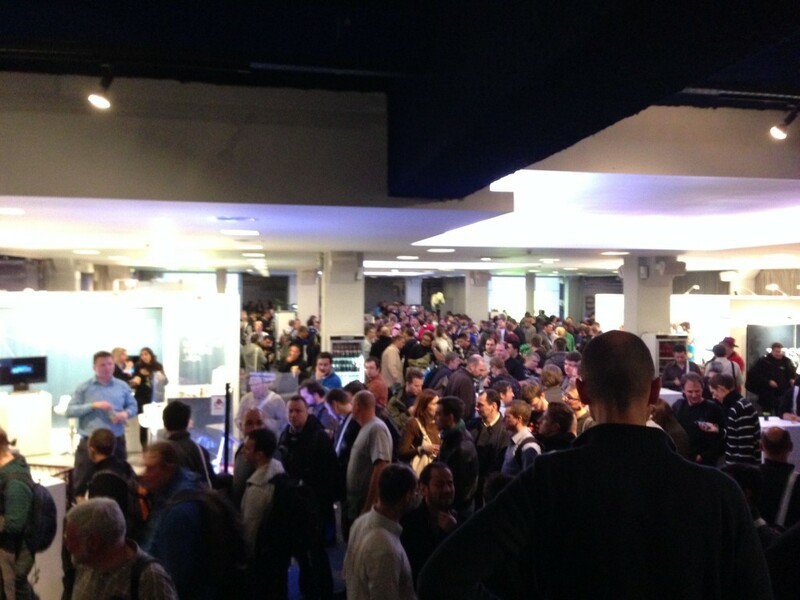 It’s quite a large conference in a large venue, I would guess around 2000 people there. The overall setup was very good: Large enough rooms, little technical difficulties, good tram connection, nice food, not that much queueing up and acceptable WIFI coverage. Have seen this far worse, thumbs up! Sadly the conference was overshadowed by a strike of the german train union, so lots of people had some difficulties getting back home. Quite some conversation went about that. But the organizers did a good job communicating this and trying to leverage things. The main topic this time was ‚Microservices‘ and all the things buzzing around that term: Docker, DevOps, Cons/Pros of the Application Server. I think the idea of Microservices sounds quite appealing: Small, self-contained and focussed applications. On the other hand, if your system consists of too many Microservices you might experience something like a Microservice hell. Newer companies like Etsy, Netflix or Groupon use and/or coined some of those microservicy ideas. Stefan Tilkov did a very good one about this. He presented ideas how you can borrow some of these newer architectural approaches in an existing enterprise world. Liked that. I think we will stumble upon some of those concepts sooner or later. Docker provides tooling to assist you in achieving quicker turnaround times for your applications. It allows smart packaging of your application and its context (i.e. OS), so you could take your application (and its container/os) from your dev box to your staging and production environment. Loads of talks about that. There seem to be rough edges here and there (Continuous Delivery tool support, dealing with databases, clustering, etc ), but nonetheless a very influential and promising tool. It naturally shines, when used in an DevOps environment. The discussion about whether we still need an application server or not is closely related. On the one hand people argued, that the application server provides a stable ground, which may need some refinement here and there. On the other hand people said, the application server is too big, needs application specific adjustment anyway, does not allow you to port a random JEE application, that vendors are too slow, etc. Some kind of middle ground was the notion to use a plain tomcat with spring, instead of waiting an average of 3 1/2 years to be able to use a newer JEE version. One surprising outcome for me was, that most people on this conference agree on the 1:1 relation between an app and an appserver. Given that it would not be a harsh step to embed some kind of server in the application itself. Some talks dealt with REST and Hypermedia. Learned how this could make your application logic more transparent. Things seem to be a little rough and ‚in progress‘ in that field. I somehow managed to miss the talks dealing with ‚reactiveness‘ altogether. Important topic. Shame on me. I saw an interesting talk how to combine AngularJS and TypeScript. I like how TypeScript provides with optional typing, the usage with AngularJS seems a little clunky to me. AngularJS 2.0 seems to go that way, we will see if that feels better. Two of the best talks I saw at WJax were both dealing with non dev stuff. One talk by Elmar Jürgens was about the proper usage of quality measurement tools and processes in your project: Use simpler metrics, don’t control the developers, don’t show quality numbers to management unless you provide context to those numbers. Entertaining talk and well done slides! The other talk by Stefan Toth was about architectural decisons and how you can defer them. It presented no fundamental new insights, but it showed the idea to explicitly use and try to extend a learning phase, to make your decison more elaborate. You will know more about your project as time passes by. Also very entertaining talk and great slides! Thanks to Stefan Zörner for pointing me at this talk. Quite some talks, but I felt that I heard most of those topics elsewhere. An interesting one by Lars Röwekamp questioned existing JEE Patterns. I am a little bit tired of Java 8 and JEE7 talks. I want to finally use it in everday work. And it seems to me that I am not alone in that. Not that much on Spring, though Spring Boot (a way to build self-contained applications) looks promising to me. Is saw very little on alternative JVM languages, though I heard a good talk by Silvia Schreier and Philipp Schirmacher about real world Clojure. I always wondered how Clojure would work in an ordinary web app. This talk showed it and saved me some time. Other notable bigger topics, that I not dug deeper into were the Internet of Things (IoT) and white collar stuff like BPM and friends. Hell of a lot of talks. It was a difficult decision all the time, I probably missed some more good ones. Less geeky than for example Devoxx, more focussed on business IT. Which could be either good or bad. Though I appreciate the nerdy and perhaps more visionary approach of other conferences, I liked the „down-to-earth“ (if you might call it so) approach. The attendees seemed to work in similar contexts. So I could connect to most of the experiences that were presented. I would definitely go there again, if getting the opportunity. With this post I try to summarize this discussion for myself. Many of the tests already in place made use of the SpringTestRunner. Most of these tests were declared ‚unitests‘. I did not regard this as a good practice using test which boot up Spring (and quite a lot of the adjacent dependencies of the springbeans) as our lowest level of tests. Some team members defended those tests as it is the most convenient way for them to write tests. Anything less was not regarded helpful to show any meaningful failures. In my book a unit test does not need the presence of a containing framework. The test take less time and you can express your dependencies more clearly when you state them explicitly. It helps me to mock out those dependencies if I don’t need them in my test. Spring should only help to glue those pieces seamlessly together. But we thought this may not be a Spring issue, so we tried to take this discussion to a more general level. In which extend do we test each layer? Of which granularity should our tests be? having read [Growing Object-Oriented Software, Guided by Tests]1, we assumed we had a similar understanding of what ‚testing‘ means regarding that context. In my case it took the form of the pyramid, putting most emphasis on the unit layer. In his case it took the form of a diamond, having more enphasis in the middle layer. As one result my teammate stated, he was not fond of the term ‚unittest‘ as it is too vague for him. In his eyes it could mean anything. It may even be a strictly technical term derivied from the TestRunner, as a testcase is often implemented as a JUnit Test (yes, we have a Java background). So every test done by JUnit could possibly be regarded as a Unit test. I disagreed and insisted that the term Unit in Object-oriented software is commonly defined as of being the class you’re looking at. He proposed a different term for that matter. For above reasons i rejected this for now as I saw no need for another overloading of words. consider it a unit. Anything else is blurry. While I question part one of this statement. (A UI has an interface but tests using this interface are mostly no unit tests), part two is rather important to me. A unit test with all its dependencies mocked out is clearly tested in isolation23. It depends on the thing and the intent of your test, how much you loosen this isolation statement. You may not need to mock out your domainmodel, perhaps you don’t need to mock out some other helper structures, if they don’t blur the intent of your test. But things like a DB, a service call, a complex algorithm or be it some framework dependency (JSF or maybe Spring), might violate the isolation of your test to some degree and possible test failures might be harder to spot. I still don’t think that the SpringRunnableTest serve a good purpose as a unittest, when you apply a TDD approach. They come with a additional load and for many testcases you don’t need Spring in place, though it might it might come handy at times that your dependencies are kicked in externally. I still do like them, when used in higher layers of the testpyramid. If the part you are about to build is not that complex – say some more straightforward CRUD part – SpringRunnableTest (as a more diamond like approach) might serve you well. 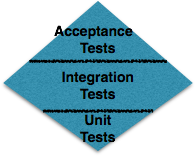 Also if you do prefer a more ‚acceptance-test-centric‘ approach (with Spring in place and the testconfiguration at your service), you might treat and design them in a unittest-like fashion. But I’ve often seen those tests degenerate from a unittest to an integration test (yet still be named unittest), becoming dependent on the outside world and becoming slower and more brittle. Another colleague showed us a handy technique using Mockito that I haven’t come across yet (Though I used mockito before, shame on me!). To avoid Spring dependency injection, and to avoid handrolling all your mocks Mocktio comes with a similar feature, that allows you to define mocks and inject them in a more concise manner link. I kind of like this approach, but some of my initial criticism kicks in here as well. The definition of your dependencies becomes more implicit. But compared to starting up Spring this approach seems to be way faster and your tests become more readable. What about isolation? As I see it, my CuT is still run as isolated as done without mockito-trickery, only your test-class becomes dependent on mockito. This may be the best of both worlds, let’s see if this technique helps that a unittest remains a unittest over time. I have been using Eclipse more or less heavily for the past 10 years now. For my last project I decided to give IntelliJ a spin. And as it turned out, I like it! IntelliJ does many things a little bit better than Eclipse. Even in the debugger view! 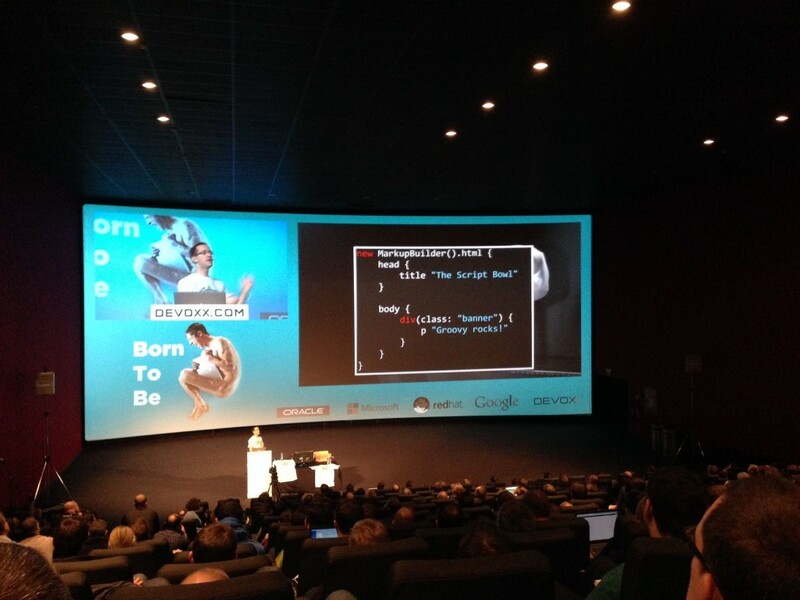 Finally I managed to visit Devoxx. I had a great time, attended many good talks and as usual few not so good ones. The most prominent topic was the upcoming JDK 8. Its most visible feature will be the advent of lambda-expressions. Which will have a deep impact on developers. Especially the collections-api feels whole new. The term reactive and the reactive manifesto was cited quite often and it fits into the aforementioned schemes. Though I was looking into the functional world recently, I didn’t quite grok the talk(s) about reactivity. Perhaps those were only bad sessions, but I guess I have to get up to speed in this area. Java EE 7 is here, but compared to JDK 8 it feels like a maintenance release. Much talking about android, which I didn’t care about. There were some Spring talks, but compared to Java EE it seems rather irrelevant. There wasn’t so much buzz around alternative JVM languages. It seemed like an accepted fact, that they have their place in the ecosystem, nothing too fancy about them any more. Use them if you like, nobody will get hurt. Recently I digged a little in the mechanism of our ID generation. But seemingly the underlying (Oracle-)sequence remained untouched. was 50. Strange! I would have expected: 1. The Logfiles then hinted me, that Hibernate chose the SequenceHiLoGenerator for ID Generation. Looking through the web here, here and here , I came close to understanding the algorithm. The idea is to not touch the DB everytime an ID is needed but to „reserve“ a block of numbers, using 50 as a default block size. Reservation is done by: 50*CurrentSequenceValue. Then Hibernate adds 1 to this base value everytime a new id is needed. When it has added 50 times, a new block is reserved using a fresh sequence value. All of this configurable of course. I am a little surprised that this is the Hibernate default though. Recently I had to dig into JMS to implement some asynchronous behaviour in our current application. I haven’t used JMS thus far, but it looked quite promising and straightforward to me. I got the ConnectionFactory and queues working quite fast and the first messages appeared in my queue. Horray! Looked quite ok to me, deployment on the Weblogic server went well. So I should be ready to rock! #### <> <> <> java.lang.IllegalArgumentException: argument type mismatch. IllegalArgumentException while calling onMessage! WTF! I was quite lost! Tweaked the @MessageDriven-annotation and doublechecked the correct signature of onMessage. But no success! After a while I set an ExceptionBreakpoint for IllegalArgumentException and found myself in the middle of JEE internals. Reflection all the way! The stateless session bean I wanted to be injected seemed to be null. Removed that code temporarily. And bang! onMessage was called. After fixing the injection everthing worked well. What does an IllegalArgumentException do to help me under that circumstances. My mistake had no obvious connection to the onMessage-method. Something more meaningful would be highly appreciated and would have saved me a lot of time. I managed to propose a session for the EclipseCon 2011 conference the last minute. The talk will deal with ouir experiences while implementing a Rich Client based on Eclipse RCP. Here is a link to the proposal. Meinen neuen Artikel gibt es jetzt auch hier auf Slideshare. Mein neuer Artikel wurde in der aktuellen Ausgabe des Java-Magazins veröffentlicht. Es geht um einen Vergleich verschiedener RCP-Frameworks hinsichtlicht der Erstellung formularbasierter Rich Clients. Eine Übersicht findet man hier. Vielleicht kann ich auch die Tage ein PDF des Artikels hier verfügbar machen. If you use features, check them! Are all plugins present? Check if all help system dependencies are present in your run-configuration. Start by adding all *help*-plugins, continue with *jetty* and *servlet*. Then press Add required plugins. That should do the trick. If you know of any other helpful tricks, please let me know!